You have no idea just what a major geek I can be. Really, major. I bought a lot of, well, technical stuff during the last few days. And this, this tops the rest. 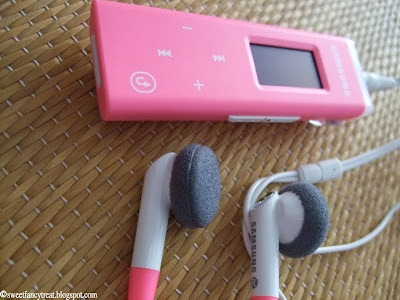 I wanted a new mp3 player for a long time now. Yesterday, when I was walking down the street, I saw it in a window. So I went into the shop, asked for it and found out that it was the last on they had on stock. It also was available in an adorable baby blue shade and black. But I thought hey, why not get the pink one if that was the one that got me into the shop in the first place? Yeah. Soooo... I took it. Now I'm trying to figure out what new music to listen to. Again. I'm always changing the music I listen to, so I'd really want to hear if you have any ideas. I usually listen to rock music (all kinds) and radio guerilla.